Online ordering menu for StevO's Pizza & Ribs #2. 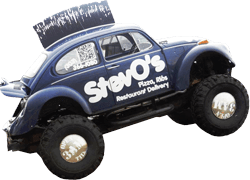 Stevo's Pizza provides oven-fresh pizza's and real smoked BBQ. We make our own dough daily and hand toss it..old style. We use old fashioned deck ovens (no conveyor belt) to make that awesome crispy crust you remember from long ago. We also smoke our own Ribs and Brisket with a real smoker and lots of black walnut and oak to make it taste like BBQ should.